April 7th, 1933 - A Giant Ape & Beer Bash at the White House! It's because of beer of course! On April 7th, 1933, beer became the only legal alcoholic beverage in the United States, that is until the rest of Prohibition was repealed 8 months later on December 5th, 1933. President Franklin D. Roosevelt had made a campaign promise to end the national ban on alcohol. Now that's a guy I would vote for! His first step was to urge Congress to modify the Volstead Act to allow the sale of 3.2 percent beer in advance of Prohibition’s ratification. On April 7, 1933, Roosevelt toasted the beginning of the end for Prohibition with newly legalized beer in hand at the White House. That must have been some party! By the next day, more than 1.5 million gallons of beer flowed as Americans celebrated, I wonder how many people called out sick the next day with a hang over? If you're in the New York area this April 7th, why not stop by the FDR library and toast FDR and the return of beer to America. Anheuser-Busch has some interesting historical information on the big day. Despite the fact that home brewing was not legalized until 1979, I plan to brew a batch, and possibly review a couple of beers to commemorate this day in history. How are you plan on celebrating 75 years of (legal) beer in America? Hopefully by legally and responsibly drinking quality beer. In the US, when prohibition was repealed with the 21st Amendment, home wine-making was legalised. 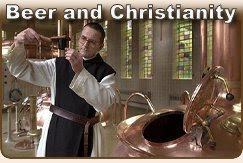 Homebrewing of beer should have also been legalised at this time, but a clerical error omitted the words "and/or beer" from the document which was eventually passed into law. 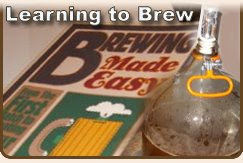 Thus, the home-brewing of beer remained illegal for several decades. 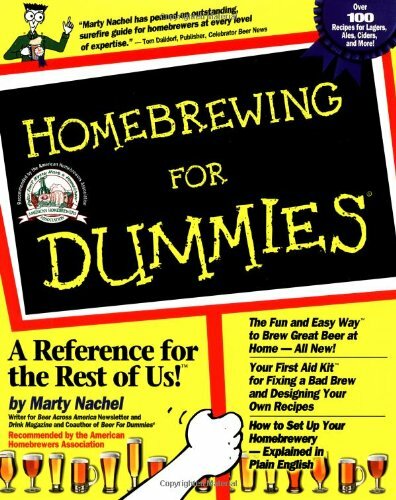 In November 1978, Congress passed a bill repealing Federal restrictions on the homebrewing of small amounts of beer. Jimmy Carter, 39th President of the United States, signed the bill into law in February 1979, and many states soon followed suit. However, this bill left individual states free to pass their own laws limiting production. For example, homebrewing is still illegal in the state of Alabama. Would the cooler be as good as advertised? Or would it be scratched up and nasty? Would the seller end up being a crackpot merely using the promise of a cheap quality cooler as bait in the hopes of killing me? Or would I have the critical element in building my own mash tun at a very fair price? I'm only half kidding here, I really did have some concerns about driving out to some stranger's house, not really knowing what was in store for me. So, despite "seller 606819995's" quick email response inviting me over to do the transaction, I made arrangements to meet in a public place. Coincidently, this"seller 606819995" lives in the town I work in, and was more than willing to meet me in front of a Dunkin Donuts just 2 minutes from my job. "606819995" failed to give me any identifying information in our email traffic. I was half expecting something like, "OK, I'll be the muscular, tattoo covered, ex-con on the Harley with the sawed off shotgun, and I'll have a couple of my buddies in a black van with tinted windows. That's what we'll use to take you to the cooler, once we tie you up and put this bag over your head..."
So... I told "606819995" to keep an eye out for a guy in a military uniform (because that's my job) and that I would be difficult to miss. 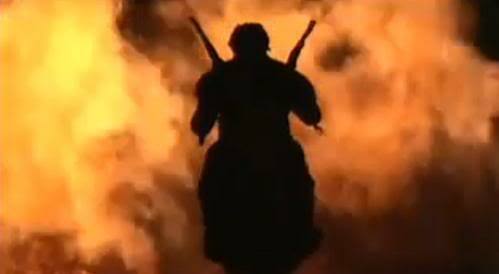 I figured, the mention of my military affiliation would subtly caution this person not to do anything unpleasant at the time of our meeting. Then I thought, maybe that was stupid, maybe this guy is selling stolen coolers to finance his terror cell, and now I'm the next target! Man this home brewing business can really be dangerous sometimes can't it? Yeah, I had my reservations, but hey you can't go wrong for $3, it was worth the risk. Cooler selling ex-cons and terrorists be damned! When I pulled up to the Dunkin Donuts, I scanned the parking lot for unsavory types with orange coolers in toe. And then it happened... A 30-something year old woman (small, smiling, friendly looking, Asian woman) stepped out of an Orange Honda Element. I doubled checked for any additional vehicles (IE dark vans) in the near by area, but all seemed well. She glanced at me with a look of curiosity. So, I stepped out and said, "Are you the one with the cooler?" And she said, "Yes," and pulled the cooler from the back of her vehicle. I gave it a quick inspection, handed her the $3.00, and went about my business. Thankfully, no one was harmed in this transaction. With my mission accomplished, I headed North towards home. OK, so in reality, buying the $3 cooler wasn't such an adventure, but I'm glad I found such a good deal. All in all the cooler is in pretty good shape. I only noticed some slight discolored streaks on a small portion of the inside. No scratches, mold or cracks are visible to the naked eye. I think I have a winner here folks. Now I need to decide on how to proceed. Do I want to hit up the Home Depot and buy the parts this guy used? Or do I want to spring for one of those false bottoms? I'm going to think about it for a while before I make a move, but I'm wide open to suggestions. And maybe, just maybe, I'm waisting my time... Should I just buy one of these pre-made set ups instead? Over the weekend, I hit my local Irish pub and did a quick comparison to the big three in Irish Stouts, but ended up finish the night with a couple tasty 10 Penny Ales... 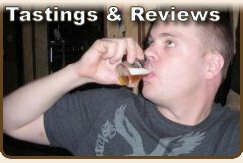 In case you don't know 10 Penny is a local CT micro that was awarded “Hartford’s Best Microbrew” for 2005, 2006 and 2007. 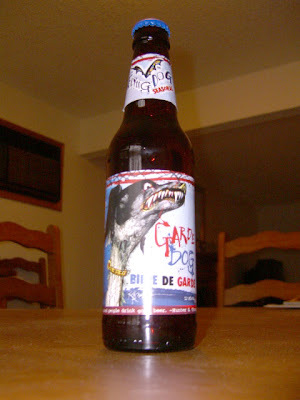 I gotta tell you, it's a damn fine beer! And it's brewed in the "Scottish tradition", a plus for guy like me with Scottish ancestry. Since tonight is actually St Patrick's Day, the wife and I are boiling up some corn beef (New England Boiled Diner) and I figured I'd hit the package store and grab an American Stout to compare with the "Big Three" from the other night. I didn't find anything that tickled my fancy at the store, so I decided to go a different route and picked up a growler of Olde Burnside Dirty Penny Ale instead. We need a cool Scottish holiday! I've been toying with the idea of abandoning the partial grain/extract world of intermediate beer recipe kits, and moving on to all grain beers. Kits are fun and easy, and the results are very rewarding, especially when compared to the limited time and effort you need to put in to make a tasty beer. But I feel I need to grow if I'm ever going to be a serious beer maker. So, I've been reading up on what I need to make the jump, and it looks like I need to get a Mash Tun. I've found some info on building your own from relatively inexpensive coolers and various parts that can be picked up on the cheap from your local Home Depot. 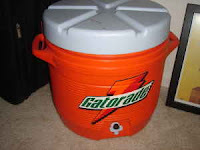 I think I found a cheap 5 gallon "Gatorade" cylindrical cooler for sale on Craig's List, right near where I work. It's listed for only $3! And I just sent the seller an e-mail to check and see if it's still available. I'm keeping my fingers crossed on this one. A $3 cooler might just be the excuse I needed to get off the couch and start this project! Stay Tuned! Note: If anyone out there has any experience with building their own Mash Tun, or has advice on going all grain, please chime in, I'm all ears and eager to learn! This year I celebrated St Patrick's Day at the Old Dublin, in Wallingford, CT with a buddy. It was a low key night filled with corn beef, cabbage, Irish Stout, and friendly conversation. I decided to take this opportunity to sample the "Big Three" in Irish Stouts and do a simple comparison. The bar was packed, so it was not conducive to do a full on run of beer reviews, so I simply enjoyed the beer and made some mental notes for later. Although I did snag a couple clips of bar tender (sorry can never remember her name) as she poured our first pints of the night. It must have been meant to be, as the only two seats open in the place were right in front of the Beamish, Guinness or Murphy's taps... I'd say it was the luck of the Irish, but I'm actually Scottish. Serendipity none the less! Beamish, my favorite of the three: Not as creamy as the other two, and finishes with a nice roasted coffee bean flavor. Oddly made me want chocolate. Guinness: A St Patty's commercial classic, creamy with a much more mild taste. The roasted undertones were subtle. Murphy's: The creamiest of the three, again a more subtle roasted malt taste, but in this case the hops were slightly more noticeable. Overall, the three were quite similar, dark as night with an inviting creamy head, mild pleasant roasted flavor, and lighter than one would expect had they never enjoyed a good Irish Stout. In any case, all three worked just fine with my traditional corn beef, cabbage and potato meal. Is this a cliche? Sure, but no more so then turkey, stuffing and a tastey brown ale on Thanksgiving. No, I prefer to think of it as a tradition, rather than a cliche, plus it could be worse, it could be Bud Light and green food coloring! EehGad! What did you enjoy this St Patty's? The irony is, I finished off the night with a couple pints of 10 Penny, you know, that local CT Scottish brew!